The fun continues as GP3 Series head into their third back-to-back race of the 2016 season. The teams have set up camp in Monza, Italy after completing Round 6 in Spa-Francorchamps, Belgium just a few days ago. This race weekends marks the final European event of the campaign with just the two flyways’ in Sepang and Yas Marina to bring to the chequered flag down on the seventh season of GP3. Series leader Charles Leclerc showed laid down a marker to his rivals’ last time out. Firstly, the Monegasque pocketed a dominant pole (by over three and half tenths) and then claimed his third victory of the year in what looked an effortless style. Arden International’s Jake Dennis who qualified in P13 produced a storming drive and showed his tyre management skills to pocket second place, and was just 2s adrift of the ART Grand Prix ace at the flag. Dutchman Nyck de Vries achieved his third rostrum of the season with P3. The smile could not have been bigger for Scuderia Ferrari Team Development driver Leclerc as he opened up a 30 point lead in the drivers’ standings. Koiranen GP’s Matevos Isaakyan started Sunday’s race from reverse pole but it was Jack Aitken who was the one to watch. First the Briton shot past Santino Ferrucci at the start to move into second and one lap later the Arden driver overtook the Russian to take the lead of Race 2. The race saw three safety car periods in which Aitken held on and looked untroubled to the flag. Trident’s Antonio Fuoco made the most of the safety-car re-starts to pick of his rivals, crossing the line in second place, ahead of Ferrucci. It was celebration time for Aitken who recorded his first win in the Series and the first for his Arden squad in 2016. Leclerc finished P6 in Race 2 to add further points to his tally after also posting the fastest lap in the opening race in Belgium. It was a weekend of disappointment for his title rival and ART Grand Prix teammate Alexander Albon. The Thai driver arrived in Belgium just three points behind Leclerc, but after qualifying in P17 and receiving contact in Sunday’s race, he only pocketed two points for his efforts. The Temple of Speed is one of the fastest circuits on the calendar and one that is challenging prospect which drivers relish with the tows down the straight meaning races are often decided across the line on the final lap. 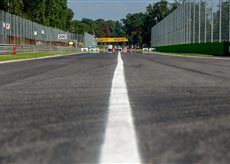 On top of the long straights and high speeds, the Autodromo Nazionale Monza is known for heavy braking, fast corners and tough for tyre degradation. Pirelli have nominated the Soft compound for this event. “The high ambient and track temperatures made for a big challenge, particularly on Saturday, and those drivers who deployed effective tyre management were rewarded with strong results. In GP3 we actually decided to modify the original nomination for Spa, which was going to be medium, in favour of soft. This was a decision taken thanks to our very good co-operation with the series promoter, in order to set an additional challenge for the GP3 drivers with tyre management. > Ralph Boschung returns to the Koiranen GP squad in his #17 car – the Swiss also carries over a three place grid penalty following an incident in Hockenheim. > Jake Hughes has a three place grid penalty following an incident with Matthew Parry in Spa-Francorchamps Race 2. > Jenzer Motorsport will run with two drivers only: Akash Nandy and Arjun Maini. > ART Grand Prix can wrap up the Teams’ title this weekend. There is a total of 279 points available for a team to score over the next three rounds. The French outfit currently hold a 252 points lead. > Jack Aitken achieved his first win of his rookie season; it was also the first for Arden International in 2016. > DAMS and Haas F1 Team Development driver Santino Ferrucci pocketed his maiden podium of his debut campaign in Spa- Francorchamps Race 2. > Trident and Ferrari Driver Academy’s Giuliano Alesi scored his first point of the season with P10 in Race 1. “I think it’s a really nice track. Not only is it my home track, it’s also the home event for Trident and Ferrari so it’s very important. We really hope to do well here. I like the track a lot, especially the second part. In particular I enjoy the second chicane and Lesmo 1 and 2. I also like the Parabolica and Ascari. It really is fun to drive. It didn’t work out so well last year so I need to put that right this season. I won two races there in 2013 so I have some good memories too. Last year I had so many fans come and I expect even more this season which is really good for me and for GP3. The number of points Charles Leclerc is leading the title battle from Trident Antonio Fuoco in second. Nyck de Vries has scored points in 11 out of 12 races this year – the only race he has failed to score points in was Budapest Race 2. The mammoth advantage French squad ART Grand Prix have over Trident in second in the Teams’ Standings. Arden International achieved their highest point tally to date in the 2016 season with 51 points.